As you know we live in a society where the use of a muzzle is frown upon by the general public. In our opinion, muzzles are not only tools to keep everyone safe, but its use reflects a dog owner who is being proactive about his dog’s behavior (possible bite) as well as responsible. There are a great range of muzzles in the market, of different sizes, models and colors. So you can choose any! But it must be tight enough that it cannot move around the face but not so tight that it cuts into the dog’s fur. The strap should be tight enough that you can barely get one finger between the strap and the dog’s head. These are just several tips for you to remember about such dog accessories as dog muzzles. Stop wasting your time because now you at the place where you will find the dog muzzle you've been searching for. Different models, sizes. Custom made muzzles are also available. Check yourself! Prices will surprise you. 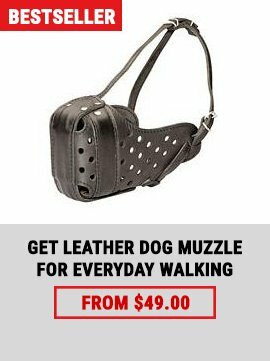 You plan to start hard training with your dog but firstly you need to by a muzzle for him? We have a very interesting offer for you. Our Super Strong Dog Muzzle can become a perfect variant for your dog training. It is constructed in order to protect the dog’s snout against injuries during training sessions. This muzzle will meet all your requirements because it is extra durable, comfortable, easy in use and fully safe dog supply. 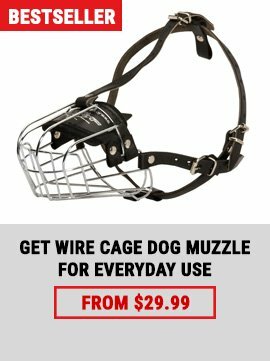 Choose this muzzle if you want your dog to succeed in training! Winter is coming and you want to take care of your lovely pet? Then, it is the right place to find the best muzzle for Winter dog wearing. We would like to present you our Wonderful Wire Rubber Covered Basket Muzzle. 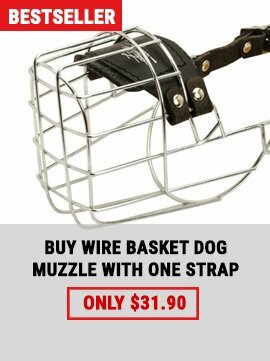 This muzzle is equipped with a special covering due to which your dog will not stick to it in Winter season. It is a lightweight construction with a perfect air circulation. The muzzle helps your dog to breathe easily and drink water when he wants.